The Blue Striped Tamarin Wrasse is a beautiful and colorful wrasse. 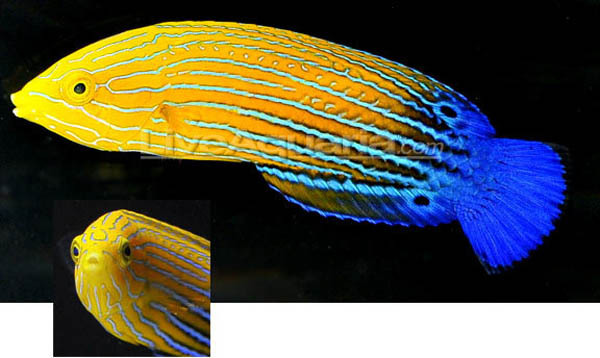 Bright yellow and orange fade into a brilliant blue tail, with fluorescent light blue stripes. This particular looks very healthy, is eating vitamin enriched Hikari Mysis and Spirulina brine, and is reportedly ready to go. This beautiful wrasse, requires a sandy bottom which it will use for sleep, or when it feel threatened. This Blue Striped Tamarin Wrasse, Anampses femininus, which hails from Australia, has been kept at the LiveAquaria Rhinelander facility for almost a month to ensure it is healthy, and will be available on tonight’s Divers Den.